Well, same offense within the redzone. This looks like a different team out there. The O line is working great. 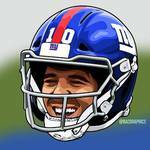 Eli looks VERY calm out there. Wasn't mike Sullivan a HC ? HE might be auditioning. hope we take a close look. Because ant success he has this year with backups and what we got he'll be in demand. I don't recall hearing that this year " Another Giant First down"
McAdoo turning over the play calling is like the Captain of the Titanic turning over the ships wheel after sttriking the iceberg. Defense looks good so far.